On top of APUs and a mobile discrete GPU, we have the next two years of CPUs and GPUs. AMD dropped a blockbuster at CES on Sunday, unveiling its plans for a 2nd-gen Threadripper, Zen 2, Zen 3, and its next-next-generation 7nm GPUs. The company even broke out a new mobile Vega chip. And that’s not even the company’s full list of upcoming products, which includes two new Ryzen APUs with integrated Vega graphics. For all those people obsessed with building the ultimate budget gaming PC, AMD offers two new low-cost chips. The Ryzen 5 2400G will feature four cores with SMT and run at a base clock of 3.6GHz with a boost clock of 3.9GHz. On the graphics side, it’ll feature 11 Vega-based Compute Units and will sell for $169. The Ryzen 3 2200G will have four cores without SMT and run at a base clock of 3.5GHz and a max boost clock of 3.7GHz. For graphics, it’ll feature 8 CUs and carry a price of $99. While neither chip will set hardware snobs’ worlds on fire, both will offer “discrete”-class gaming on a chip. The Ryzen 5 2400G will offer comparable gaming performance to an Intel Core i5-8400 and a GeForce GT 1030 in many games. At $169, it will cost far less than the $288 for the Intel and Nvidia combo. Both new APUs are due to be available in February, AMD said. Both APUs are fully compatible with existing 3-series motherboards but will require BIOS updates before working. AMD said upcoming motherboards using a new X400 chipset will work out of the box as well. Details of the X400 chipset were not released. It’s expected to enhance support for Zen+ CPUs but will likely be an evolutionary upgrade. AMD said this spring will see an improved Ryzen CPU built on a new 12nm process. AMD said a new iteration of its hit Ryzen CPU, called Zen+, would come in April, using a new 12nm process instead of the current 14nm process. The company didn’t explain the nomenclature, but it did say the CPUs would clock up higher than current Zen-based chips. The new chips will feature the newer Precision Boost 2 frequency control, and an improved XFR2 clockspeed booster. The new chips will also include an improved cache, as well as memory-speed and latency improvements. Officials told us unofficially to expect at least a 10-percent performance increase. 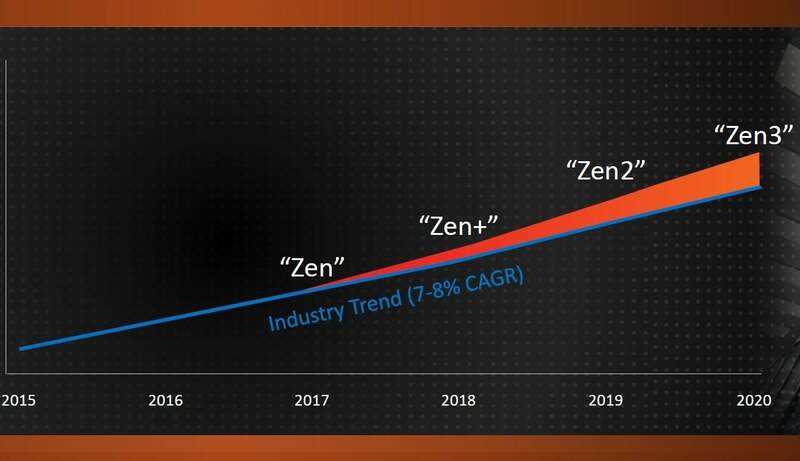 With Zen+ out, AMD said to expect Zen 2 in 2019 using a new 7nm process. A year later, Zen 3 will roll out using an improved 7nm+ process. Details of the chips are still too far off to reveal, but AMD officials said to expect them to offer far more than the usual 7- to 8-percent performance bumps we’ve seen with typical “industry” updates. That’s AMD’s way of throwing shade at Intel. AMD expects CPU launches through 2020 to far exceed the typical 7-percent to 8-percent performance increases we’ve seen of late. For power users looking for some love, AMD said to expect a sequel to its vaunted Threadripper lineup. Again, details of the 2nd-gen Threadripper are sparse, but the company put its launch in the second half of 2018, which suggests its Zen+ cores could be the basis of any updated Threadripper chips. AMD won’t ignore its graphics customers either, and said this year would see its first 7nm-based Vega chip. Gamers, unfortunately, won’t be the first ones to get them: The first 7nm Vega parts are aimed at its machine-learning customers and will sample to them this year. AMD’s official graphics map turns to its newer Navi graphics core, also built on a 7nm process, and then an unnamed graphics core built on a 7nm+ process. It looks like the 7nm-based Navi should show up in 2019 or sooner. AMD and Intel recently revealed a custom Radeon graphics chip, but Intel won’t be the only one getting Vega-based graphics. AMD announced a tiny Radeon Vega Mobile chip GPU. Like Vega on desktop, the Vega Mobile uses fancy HBM2 memory. It has a tiny footprint and will measure no more than 1.7mm in height. AMD said the chip is aimed at thin performance gaming laptops. 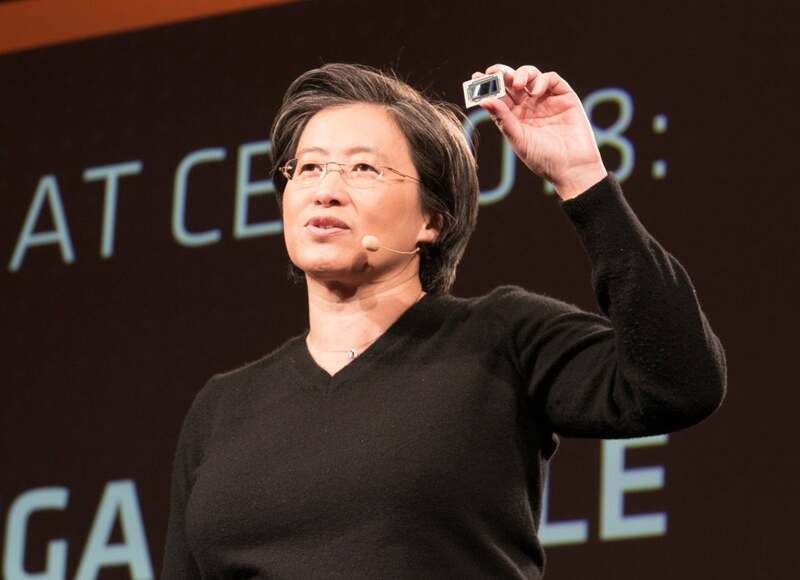 AMD CEO Lisa Su holds the company’s latest Radeon Vega mobile chip.